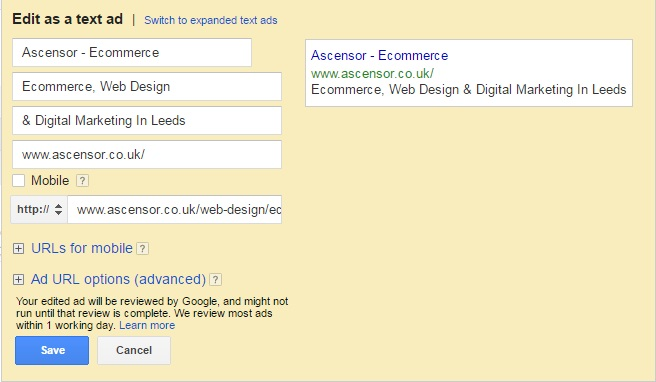 Google Adwords - New Expanded Text Ads! Google has changed the game releasing the next generation of EXPANDED text ads! The 25- character headline and two 35-character description limits are no more! Therefor the magic combination 25-35-35 no longer means anything in Google Adwords PPC marketing, in which we have been limited by all these years. The new Google Adwords expanded text ads give advertisers additional power to provide more information before you click their ad. The change now allows for two headline fields (up to 30 characters each) and a single, expanded description field (up to 80 characters) which means the new combination is 30 – 30 – 80. Including two optional path fields and a new display URL. This is a total character increase of 47%! These changes have been implemented by Google to favour the world that has gone mobile mad! The original format of 25 – 35 – 35 has been with Google since the start 15-years ago. As you may know back then phones were just used for calling people. However, continuous advancements in mobile technology mean that most people now use mobile devices as a go to over the traditional desktop for their web searches, Google now favours mobile friendly sites. Google Adwords will allow users to create and edit standard text ads until 31st January, after this date only expanded text ads can be created. However existing standard text ads will still continue as normal, therefore there’s no rush to renew all your ads just yet! Some of you may not be aware of the 25-35-35 standard text ad format in Google Adwords, if this sounds like you, we have created a short visual guide which will help you determine the differences between the two formats. 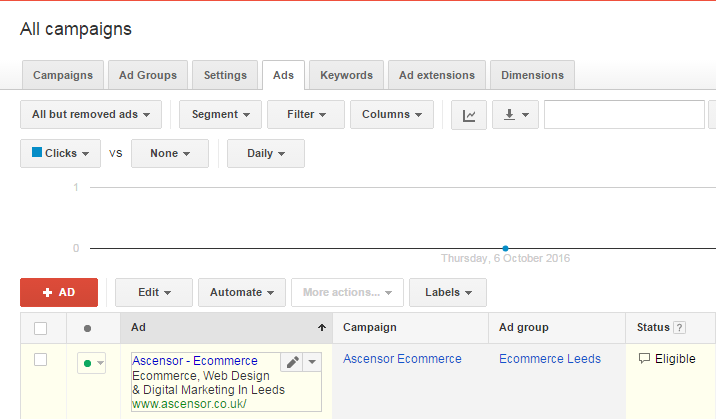 The guide also shows how to change Standard text ads to the new expanded text ads format. As shown below the Google Adwords standard text ads works on a basis of Headline (25 characters), Description line 1 (35 Characters), Description line 2 (35 Characters), Display URL (35 Characters) and a Landing page. This format allows you two get across your key information, but this limits you not adding much more for customers to see. With 47% total character increase the expanded text ads format gives you plenty more characters to take advantage of, allowing you to provide users with more information before they click your ad. As you can see from the examples shown above the Expanded Text Ads format with the larger character limit allow advertisers to create better communication with customers to promote their product or service, use this to your advantage and write more enticing language. How do I change my existing standard text ad to an expanded text ad? Choose one of your active campaigns and select the ads tab from the menu available, then hover over an existing ad and click on the pen icon that will come available. Clicking this icon will make a menu appear which by default is set to ‘edit as an expanded text ad’. Until the 31st Jan 2016 there will be an option to switch back to standard text ads - this can be found at the top of the menu in blue text. The options to switch between the two formats are underlined below in red. Flicking between the two you will notice that there is a lot more available on the expanded text format, such as the opportunity to add a second headline, 2 path fields and more description space available to add more information. To the right of the menu you will be able to preview your new expanded ads on both desktop and mobile. How do I make the most of expanded text? After creating a new expanded text ad, we recommend that you wait until the ad is approved before you pause the existing standard text ad. With the availability of a second headline, it could be tempting to simply add a headline to an existing ad. It is best to start from scratch; rethink the entire message you want to present. With more space at your disposal take advantage of the new character limits to communicate with potential customers and drive qualified clicks to your website. Optimise your headlines – Consider the ways your ad may display on different devices such as tablet and mobile phone, to make sure how your ad is presented. If you need any help in getting to grips with this or any other Google updates, get in touch!